Municipality of Magnetawan (Single Tier Parry Sound)Record Owner? Log in. F. H. Baddeley of the Royal Engineers explored the area in 1835. Settlement did not start until the Nipissing Rd. was cut by the Dodge Lumber Company from Rousseau to Magnetawan in 1873. By 1879 there was daily steamboat service from Magnetawan to Burk's Falls and from Magnetawan to the foot of Ahmic L. The routes were joined by a lock at Magnetawan in 1885. 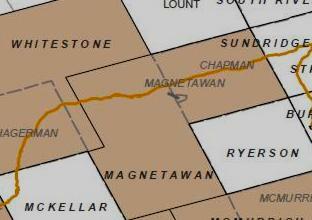 The post office was established as Magnetawan. The oniginal spelling was Maganetawan and the First Nations Peoples word meant “swiftly flowing water,' an apt name for a river that drops 800 feet (243.8 m) on its way from Algonquin Park to Georgian Bay. In 1872 the govemment adopted an immigration policy that offered subsidized steamship fares and free inland transportation to European settlers. Elise von Koerber was one of several special agents appointed, and by 1877 she had brought several hundred Swiss to this region of Canada. Have something to say about Municipality of Magnetawan (Single Tier Parry Sound)?